Fighting to be Frugal: Want to Win a Kobo E-reader? Want to Win a Kobo E-reader? Perhaps you've wanted one, but don't have the cash on hand. Perhaps you already have one, but hey, if you had another, you could stash it away as a gift for Christmas/birthday/other celebration (money saved at the end of the year for something else). 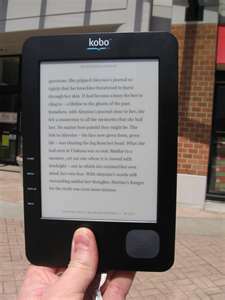 Regardless of your reason for wanting one, CBC is giving one lucky person a brand new Kobo reader. It could be you! Mainstreet on CBC, 96.1 FM wants you to come up with an opening to a story that includes at least one of the the following words: 96.1, Mair, Boomer, Walker, 96.1FM, Mainstreet. The contest runs until Friday March 16th, 2012. Please see contest details here.